Scrap Shakers at Baxi Boilers of Preston. They took delivery of the first UK scrap shaker in November 2005. 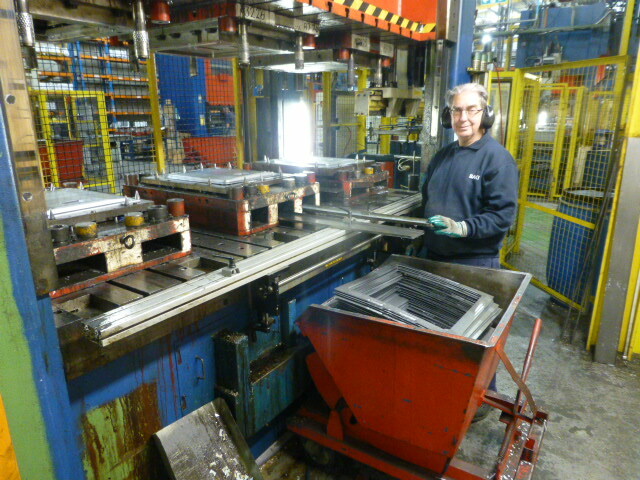 With a scrap shaker tray clamping beam of 2,500mm, stretching along the back of the press, the ‘setters’ have to replace only the scrap trays for each tool. No spare parts have ever been required even though it has been running 12 hours/day 5 days a week for the past 10 years. As the Press Setter John Waite stated “it’s never missed a beat”. Baxi engineers found that belt conveyors were not reliable and in many cases not shallow enough to lay under the press tools and so remove large ‘3D’ components.. Being an electro mechanical scrap shaker, the Premitec shaker unit provides a reliable alternative to belt conveyors and air shakers, as belts can sometimes tear and air shakers fail due to poor quality air, pressure or lack of robustness. The Baxi tool setters found that the scrap shaker is very easily adaptable to meet their requirements. A selection of trays can be mounted on the unit. different lengths, and widths. Common trays can be used for different tools. The length of the trays present no problem. As long as the scrap trays do not weigh more than 50kg, the scrap shaker will perform to it’s guaranteed standard specification. Scrap Shakers can be found in many other industries, which are ideally suited for this method of transportation such as in casting, foundry, machine tools, the chemical industry and the food industry. Many of these industries have replaced conventional belt conveyors due to the reasons as stated in the second paragraph above. Premitec UK are happy to celebrate Baxi’s 10th year of trouble free scrap shaking. Success made possible due to a simple robust design. Baxi also use the Premitec UK Die Lifters to load and unload press tools. But, that’s another story..!